In the previous article in this series exploring the changes that have occurred in our visual environment, I considered how static images such as landscapes have altered. That was a highly artificial situation, though, as most of what we see is constantly changing; if it doesn’t move, we move, and the direction of our gaze moves too. The perception of motion is crucial to many images in art. Often, paintings try to tell a story in which movement is central, but a single painting can only show a single, frozen image. Depicting motion in paintings is therefore vital, and a major challenge to artists. In two-dimensional representations of motion in three dimensions, motion is normally only implied by exploiting the mental rules which we apply when perceiving images. We know (presumably by experience since our first moments of sight) that objects don’t normally hover in mid-air. If we see an arrow in mid-flight, those rules tell us that it is moving, and it usually takes little to guess where it has come from, and where it is going to. Body postures provide additional cues. 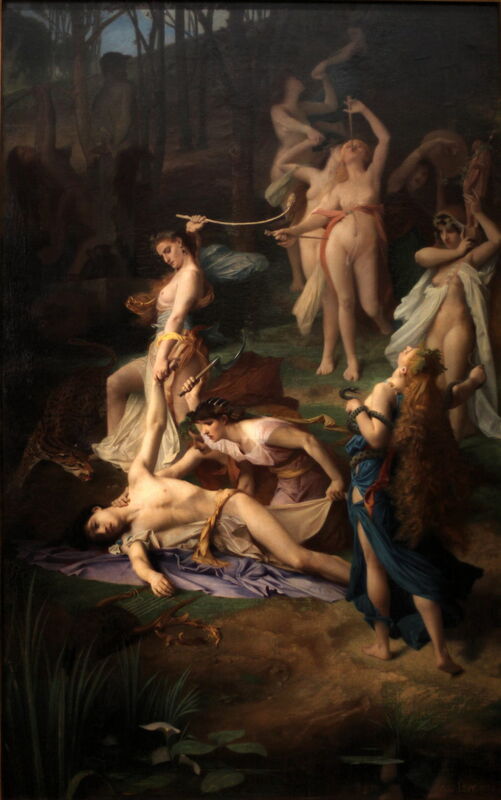 Émile Lévy (1826–1890), Death of Orpheus (1866), oil on canvas, 189 x 118 cm, Musée d’Orsay, Paris. Wikimedia Commons. We know that the thyrsus and sickle being wielded by these bacchantes are being swung, and that the painting has captured an instant in their motion. 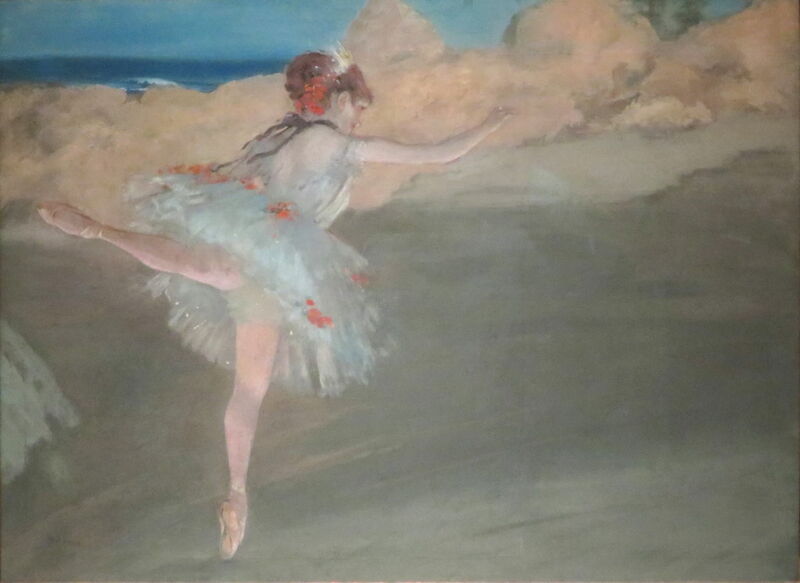 Edgar Degas (1834–1917), The Star: Dancer in Pointe (c 1878-80), gouache and pastel on paper, dimensions not known, Norton Simon Museum, Pasadena, CA. Wikimedia Commons. Experience of watching other humans tells us which positions are stable, and which transient moments in motion. Degas’ dancer is thus a frozen frame from a motion sequence, and our brains envisage the sequence which her body went through. This has been confirmed in recent studies using imaging of the brain, which demonstrate that the specialised parts responsive to visual motion are also activated by such images. Degas thus succeeds in eliciting the perception of movement in his still image. 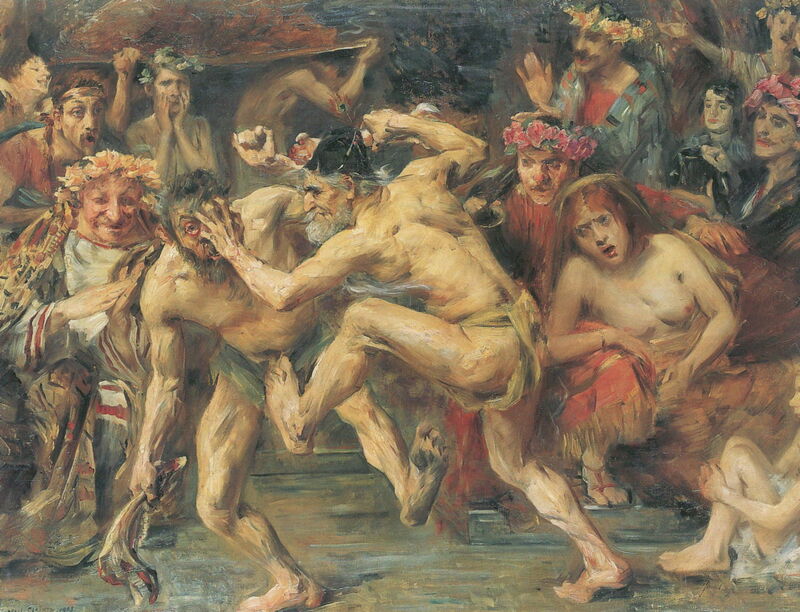 With Ulysses’ manifestly unstable position, we interpret Lovis Corinth’s depiction as capturing him in the midst of movement. Corinth provides us with some additional clues too, in the sweep of his hair and clothing. Posture, gesture, facial expression, open mouths, all provide additional information that these figures are dynamic relative to the static background. 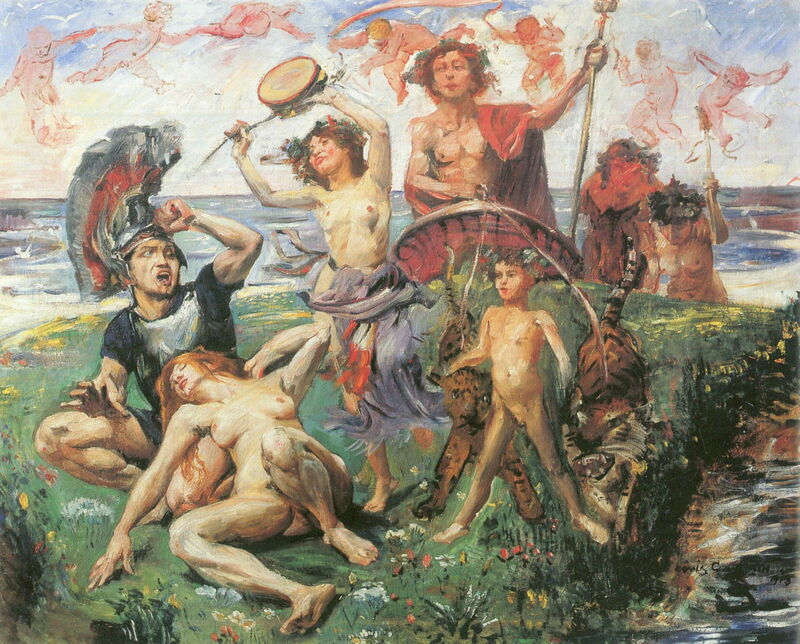 Louis Bouquet (1885–1952), The Death of Orpheus (1925-39), oil on canvas, 98 × 131 cm, Private collection. Image by Jcstuccilli, via Wikimedia Commons. 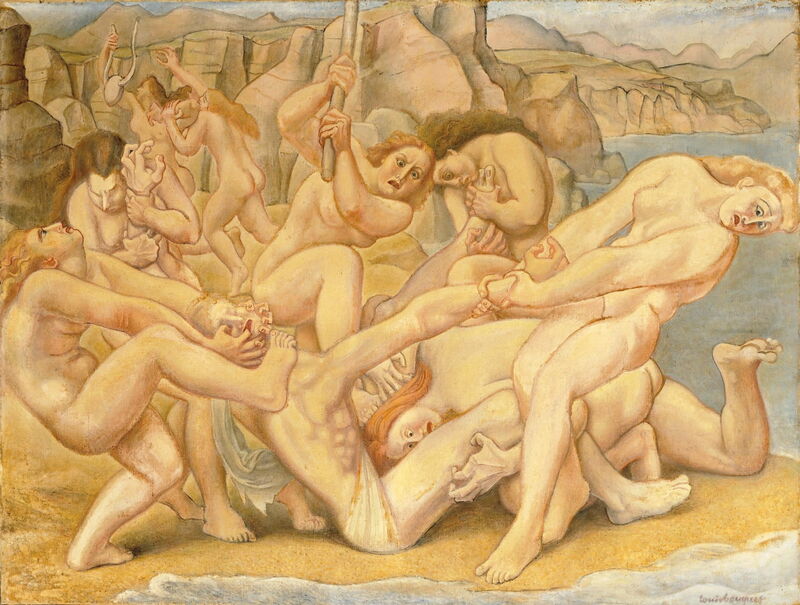 The advent of still photography and movies hasn’t changed these basic techniques of implying motion, as shown in this painting of The Death of Orpheus made between 1925-39. The depiction of specific types of motion requires more care, though. When running, we lean forward, and although both feet do leave the ground simultaneously, the painter has to study human motion very carefully to ensure that what they paint appears realistic and not false. Artists like Guido Reni would have looked very carefully at people running before painting Hippomenes and Atalanta so effectively. Reni uses another popular device in implicit motion here: strips of flying fabric, which we know trail behind a moving body and render its slipstream visible. Such strips are also used to indicate relative motion of the air, so our brains have to determine whether it is the body which is moving through static air, or air which is moving past a static body. Given the other signs of motion, that is easily resolved here. Bring all those clues together, and a skilled and observant artist can show two people, again Hippomenes and Atalanta, running past a crowd of people waving and cheering them on. Occasionally, artists have few or none of these techniques available. 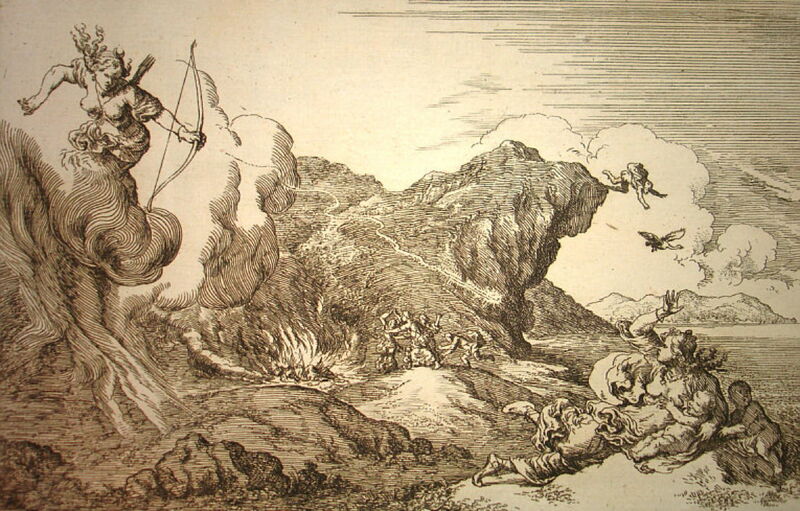 Johann Wilhelm Baur made explicit the course of the arrow in flight from Diana’s bow, as it heads towards the unfortunate target of Chione, in this engraving to illustrate Ovid’s Metamorphoses. In the background, he has placed Daedalion in an obviously transient posture as he throws himself from a cliff. These work well for motion which the unaided eye can resolve by careful study. But some motion is so rapid and complex that artists could only guess what to show, the most common example of this being the galloping of quadrupeds like horses. 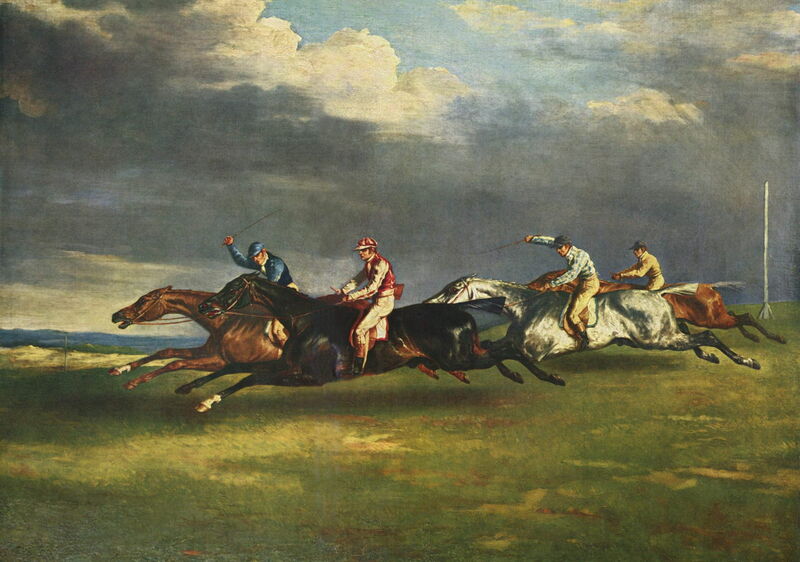 Artists like Théodore Géricault who had studied this carefully often showed galloping horses in this airborne position, with their legs fully extended and all four hooves well clear of the ground, as in his painting of The Epsom Derby (1821). January Suchodolski (1797–1875), Furūsiyya (1836), oil on canvas, 55 × 58 cm, Muzeum Narodowe w Poznaniu, Poznań, Poland. Wikimedia Commons. 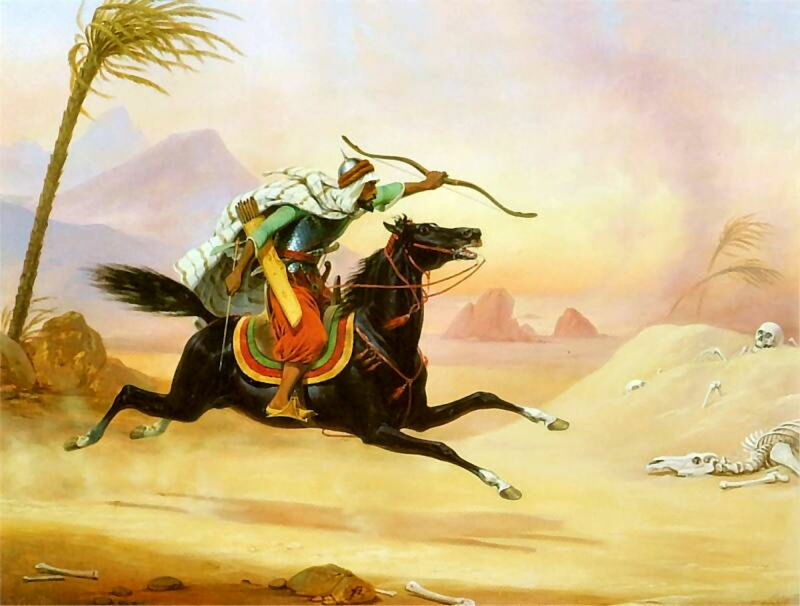 This is shown again in January Suchodolski’s Furūsiyya (1836). 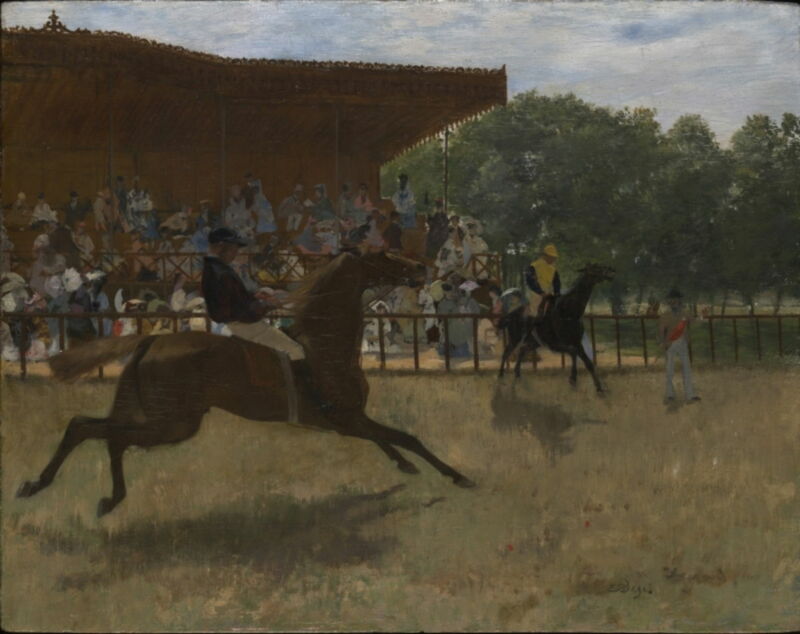 Edgar Degas (1834–1917), The False Start (1869-72), oil on panel, 32 x 40.1 cm, Yale University Art Gallery, New Haven, CT. Courtesy of Yale University Art Gallery, via Wikimedia Commons. By the time that Edgar Degas painted this posture in The False Start (1869-72), its veracity was being challenged. In 1872, Leland Stanford, who had made his fortune from the American railroads, hired the British photographer Eadweard Muybridge (1830–1904) to use photographic techniques to establish whether the galloping horse does ever assume the posture. 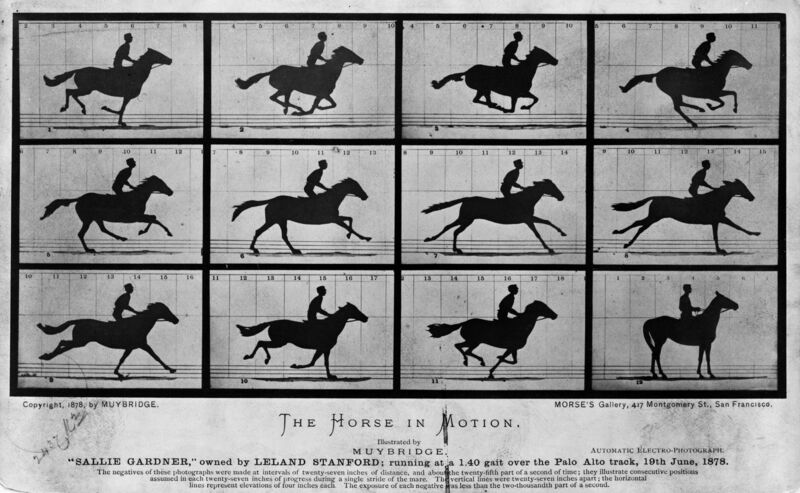 It took Eadweard Muybridge several years to devise an ingenious system using a dozen cameras to settle the matter, but in 1878, that answer came in this photomontage in The Horse in Motion: in fact, the moment that all four hooves are clear of the ground is when the legs are tucked under the horse’s body, not when they are full extended. This was, and still is, seen as a moment of triumph for new photographic technology, demonstrating a truth which had eluded centuries of great artists. It spawned a succession of studies of different modes of human and animal motion. Étienne-Jules Marey (1830–1904), Man Running (1883), photographs, further details not known. Wikimedia Commons. At a time when engineering, the sciences, and mechanistic views of how humans functioned were in the ascendant, this was a triumph of modern technology, and many artists changed the way in which they depicted the galloping horse. Muybridge and Marey’s images became influential to artists, including Degas, but limited insight into human vision led to misunderstanding. Like the moon illusion, knowing that horses never actually achieve the classical painted posture does not affect our perception of the horse’s movement. The artist’s purpose is not to show a physically accurate representation of an instant, but to persuade or even trick the viewer into perceiving the image as they intend. The impossible posture of a horse galloping is completely effective in that, so remains valid. The photographers and advocates of technology were also deliberately avoiding the problems raised by photographic artefacts, which they saw as temporary technical issues. Salient among those was, and remains, motion blur. Images formed in our retinae have persistence, which we perceive most vividly when looking at relatively bright objects such as flames and fireworks in the dark of night. The moving light leaves a ‘visible trail’, an effect which is often exploited by entertainers and in firework displays. But it is not something of which we are aware in more normal, daytime lighting. We don’t perceive passing vehicles as being blurred by their motion, as we either look at and track the moving object, or concentrate on the stationary surrounds. The camera has an inherent persistence resulting from the finite period over which it must capture its image. With long shutter speeds, slow-moving objects blur in front of a static camera, or, if the camera tracks the moving object, the static parts of the image are blurred. 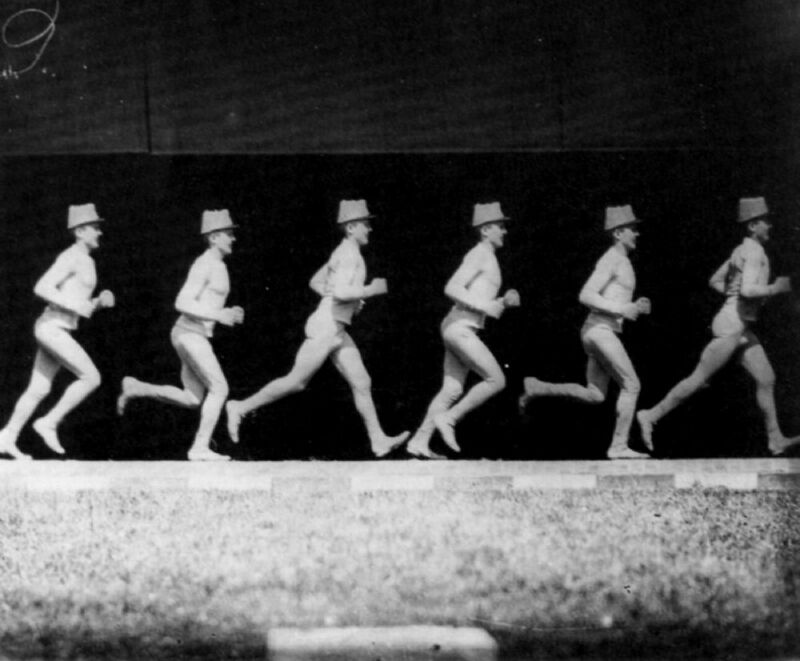 Even with the high shutter speeds used by Muybridge, the faster the motion, the more blur appeared. Photographers avoided this clear demonstration that the camera didn’t always tell the truth, and ducked the response that in this case it was the painter’s crisp image which was more faithful to reality. 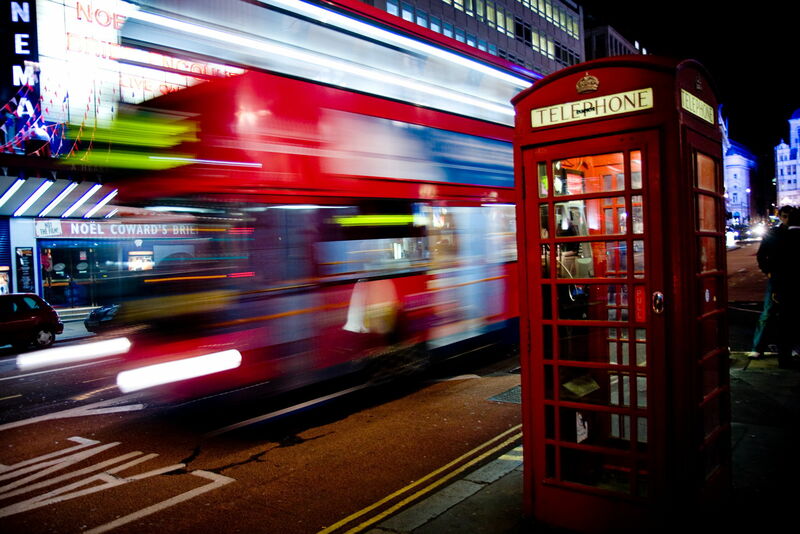 E01, A London bus passes a telephone box on Haymarket, Westminster, London, UK (2008), photograph, further details not known. Image by E01, via Wikimedia Commons. We don’t see London buses blur in this manner, and we know that in physical reality they don’t blur either. Paradoxically, this limitation in photography has become so commonplace and accepted that it has become part of our everyday perceptual experience, and has been incorporated into visual art. The first paintings using motion blur started to appear at the end of the nineteenth century, as viewers became increasingly accustomed to seeing and reading photographs. As a painting technique, it appears to have been used initially to enhance the feeling of motion in representations of dance. 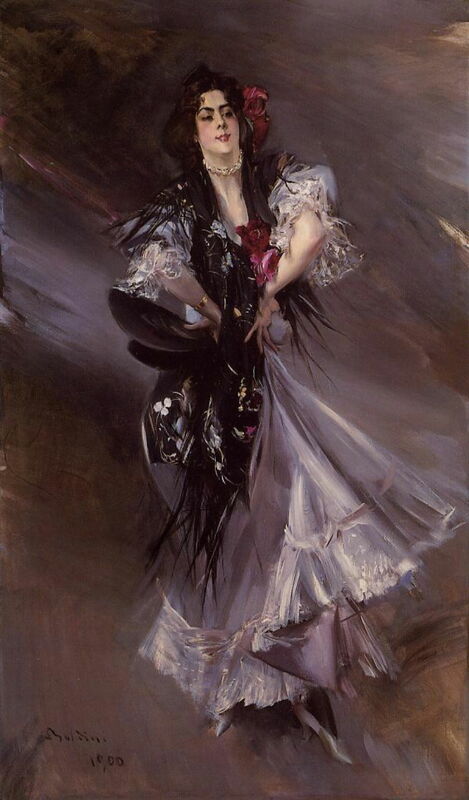 Giovanni Boldini (1842–1931), Portrait of Anita de la Ferie, ‘The Spanish Dancer’ (1900), oil on canvas, further details not known. Wikimedia Commons. Giovanni Boldini seems to have used it here for the background, and more slightly at the edges of the dancer’s clothing. 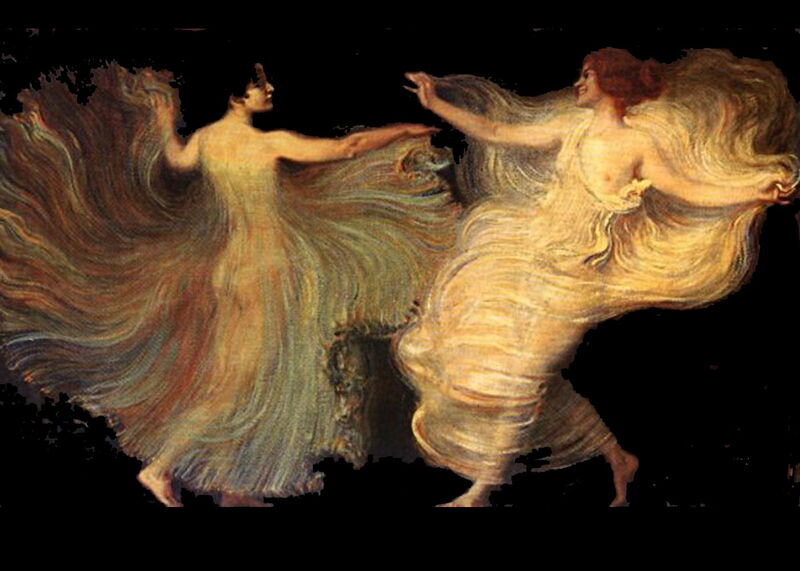 Franz von Stuck appears to have used ‘flowlines’ here rather than simple motion blur. During the twentieth century, motion blur was stylised into motion lines, widely used in cartoons, comics, and illustrations. Carlos Latuff (1968– ), Bombs print (edited by Chris McKenna) (2013), cartoon, further details not known. Courtesy of Carlos Latuff and Chris McKenna, via Wikimedia Commons. Without the lines, the very rapid motion of Carlos Latuff’s aircraft would have been too implicit. Prior to photography, artists had discovered techniques of depicting motion in figures and objects which exploited human visual perception. These include posture, stability, relative position of more mobile hair and fabrics, and occasionally making the path of motion explicit. During the late nineteenth and early twentieth centuries, human perception changed as a result of exposure to photographic images, bringing motion blur, motion lines, and other visual devices. What to our ancestors would merely have appeared to be a blurred and defective image has taken on new meaning. In the next article in this series, I will look at the changing graphical environment. Posted in General, Life, Painting, Technology and tagged Baur, Boldini, Bouquet, Corinth, Degas, Géricault, Hallé, history of painting, Latuff, Lévy, Marey, Muybridge, narrative, painting, photography, Reni, Suchodolski, vision, von Stuck. Bookmark the permalink. There is, also, the argument made by some art historians that the blurring of movement by long exposures influenced the depiction of people in some Impressionists’ work – e.g. Monet. See ‘Art and Photography’ by Aaron Scharf. I looked for examples of Impressionist paintings in which figures were clearly blurred but the background was not, which might indicate motion blur, but couldn’t find any, apart from the Boldini, which is of course the other way around (ish). If you or anyone else knows of other paintings which might be suitable examples, I’d love to hear of them. I’m not doubting their existence, just not able to find one to illustrate the point. There are of course lots of Impressionist paintings, like many of Renoir’s, which are generally soft focus, but that seems to be rather different, and occurred before the advent of photography too.